From our earliest days, play is a key aspect of learning. In fact, learning is the basis of every game – in order to progress, we must obtain knowledge about the system upon which it is built. Some of our most significant critical thinking, teamwork, strategic and tactical skills are cultivated on the playground, chess board, basketball court, poker table and/or video game console. Games are fun, improve retention, encourage healthy competition and allow us to be part of the action, instead of passive bystanders. Our games are based on the formats of familiar game shows and are interspersed throughout the courses to target specific learning objectives. Initial response from learners has been overwhelmingly enthusiastic. Game On! leverages two emerging trends: gamification and bite-sized learning. Role-playing modules that put learners into a simulation environment have long been offered in the service management space. They encourage learners to apply concepts in a neutral environment by graduating from uncontrolled to controlled processes. The simulations are not focused on specific learning objectives, but take a more broad-based, practical perspective. ITSM Academy classroom games are bite sized opportunities that reinforce examinable concepts in a fun, relaxed and interactive way. 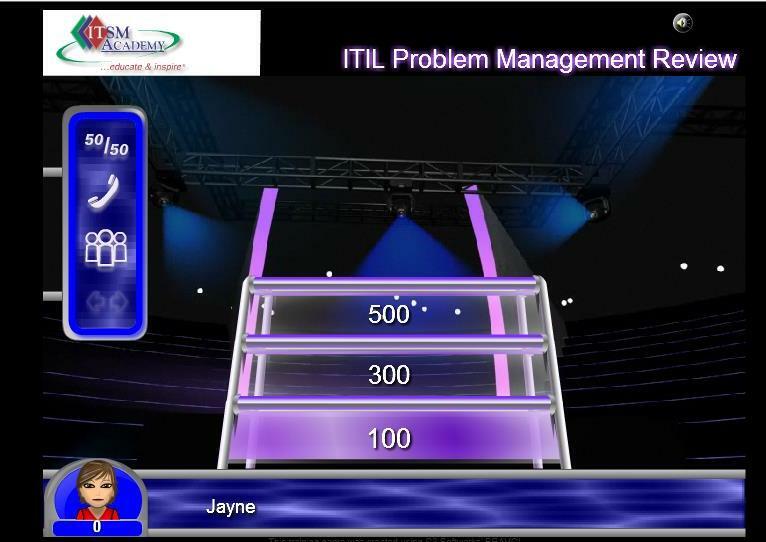 At the outset, ITSM Academy games are being used in our classrooms to harness the power of play for exam preparation and knowledge application. Someday soon, we will take Game On! An Interactive Learning Experience to the next level of a recognition-based gamification strategy. Stay tuned!